Today, 14th March, is Pi Day. In the month/day format it is 3/14, corresponding to 3.14, the first three digits of π. So, have a Happy Pi Day. Larry Shaw of San Francisco’s Exploratorium came up with the Pi Day idea in 1988. About ten years later, the U.S. House of Representatives passed a resolution recognizing March 14 as National Pi Day. Today is also the birthday anniversary of Albert Einstein, giving us another reason to celebrate. He was born on 14 March 1879, just 134 years ago today. Every circle has the property that the ratio of its circumference to its diameter is a constant, denoted by the Greek letter pi (π). This letter, chosen as the initial letter of ‘perimeter’ or ‘periphery’, was popularised by the great Swiss mathematician Leonard Euler. Its value is approximately 22/7, a “rational number” or the ratio of two whole numbers. But π is irrational: it cannot be expressed exactly as such a ratio. And its decimal expansion, starting 3.14159…, continues eternally without repetition. Archimedes determined π accurately by considering polygons inscribed within a circle and polygons surrounding it. It is easily shown that a regular hexagon, a polygon with six equal sides, fitting snugly within a circle of unit diameter, has length 3. But observation makes it clear that this is shorter than the circumference of the circle, so π is bigger than 3, the value implied by a passage in the Bible (1 Kings 7:23). A less obvious, but still elementary, derivation shows that a hexagon drawn around the circle has length twice the square root of 3 or about 3.46, and π is less than this. Hexagons and octogons within and around a circle. Archimedes of Syracuse used polygons with 96 sides to get a much more precise estimate of π. The ratio 355/113 gives π correct to seven figures; this was known to the Chinese mathematician and astronomer Zu Chongzhi in the fifth century. It is easily remembered: write 1 1 3 3 5 5, and divide the number given by the last three digits by that given by the first three. You may never need more accuracy than this. However, the computation of ever more accurate estimates of π has preoccupied enthusiasts for centuries. Isaac Newton computed fifteen digits of π by adding many terms of an infinite series (there are numerous series and products for computing π but, because of its irrationality, all involve an infinite number of terms). Later, Euler solved the “Basel Problem”, showing that the sum of reciprocals of squares of all the natural numbers comes to π squared over six. This turns out to be closely related to the properties of the prime numbers. Early in the 20th century, the Indian mathematician Srinivasa Ramanujan found many new elegant expressions for π. 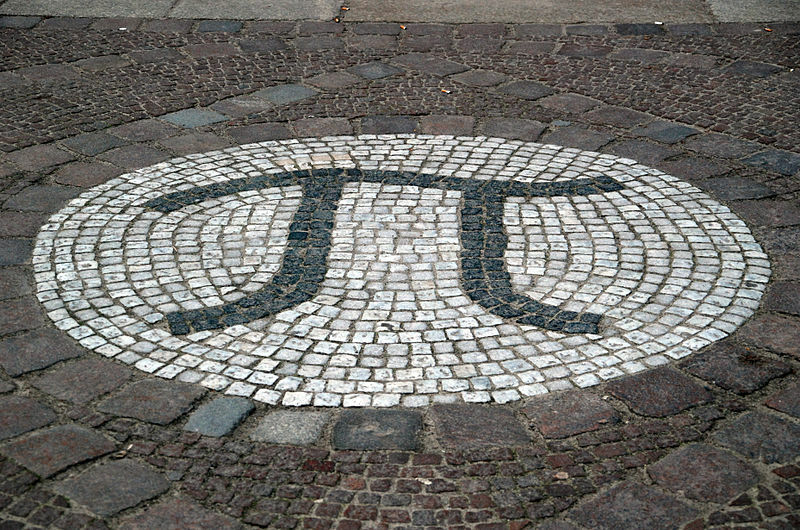 The current record claimed for computing π is five trillion digits; that is, 5 followed by 18 zeros! Counting the letters in each word, we can write 3.1415 92653 58979, giving 15 digits of π, more than you are ever likely to need. Actually, Jeans’ mnemonic is more prose than poetry. We might call it pirose, or prose written in Pilish. Pilish is constrained writing where the lengths of the words match the digits of π. It seems that a full length novel in Pilish has been written!